A circular saw is one of the most turned to power tools in the industry. With the capacity to cut just about any material and to cut it just about any way you need it cut, circular saws are some of the most universally useful and commonly used power tools on the planet. Accordingly, in the interest of different projects or applications, or simply because a certain blade has seen better days, the occasional circular saw blade change is inevitable. Fortunately, changing the blade on your circular saw is quite a bit easier than you might think. In fact, with just a few simple steps and an adjustable wrench, you can have that blade changed in no time. As with all other power tool repairs and procedures, the first thing to do to begin your circular saw blade replacement is disengage the tool. Turn the tool off and remove the battery or unplug the tool and ensure the entire cord remains in sight for the duration of the repair. Lay the saw down on a sturdy surface allowing the blade to hang slightly off the edge of the table. If you have access to clamps, securely clamp the saw to the bench. If not, simply use your weight to secure the saw holding it steady with the saw’s operating handle. Slide up the protective blade guard and hold it in place, if necessary holding it with the thumb of the hand securing the saw to the table. Slowly rotate the saw blade by hand to locate the blade’s offset hole (a smallish hole drilled through the blade at a point usually not far behind the saw teeth). Insert a standard 3/8″ drill bit (or similarly shaped object) half-way into the offset hole and continue rotating the blade clockwise until the bit hits the saw itself. Although many newer circular saw models feature a blade locking mechanism that would render this step unnecessary, the bit will, nonetheless, keep the blade from moving as you continue with the procedure. 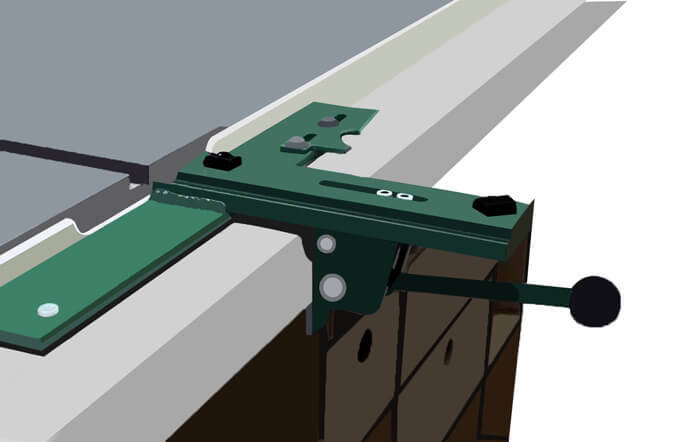 Attach an adjustable wrench to the blade bolt at the center of the saw blade. This bolt holds the blade to the saw and, to ensure the blade remains secured to the saw while the tool is engaged, has a left-handed thread or the opposite thread one is accustomed to. Accordingly, the bolt must be rotated clockwise to be removed. Remove the bolt, remove the bit, and remove the old blade. Slide the new blade over the saw’s blade hub and, by hand, replace and lightly twist the blade bolt onto the hub. Re-insert the bit into the offset hole and rotate the blade counterclockwise until the bit catches on the saw’s body. Tighten the bolt firmly by hand before securing it completely with your adjustable wrench, and lastly, plug the saw back in or replace its battery and give the saw spin (carefully) to ensure everything has come back together properly. 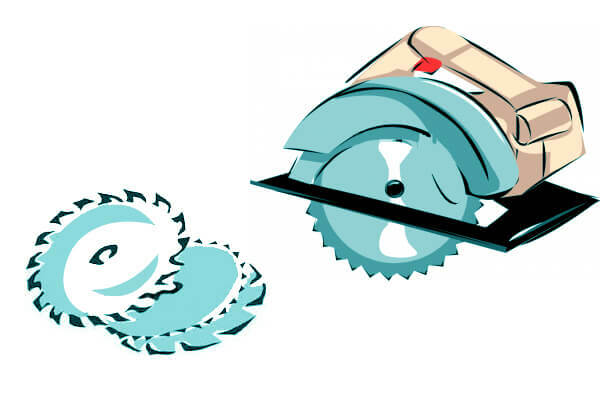 Circular saws come in two primary styles. The first is the worm-drive which consists of a blade that is located to the left, which makes it useful for right-handed individuals. They are heavier than other options, but have more torque than the second style, the sidewinder. The sidewinder, which is perhaps the most common form of the circular saw, consists of a high handle with the blade placed on the saw’s right side. They are usually less expensive and lighter and are also able to spin faster than the worm-drive. Most tradesmen believe that sidewinders are a better choice than the worm-drive. These saws are most often categorized based upon the blade’s diameter. The most popular size is 7 ¼ inch, which is able to cut through 3 inch materials and offer a large number of blade choices for various substances. Saw power is defined in terms of amperage. The standard power is typically 15 amps but infrequent use usually requires no more than 10 to 12 amps. The majority of sidewinder saws look similar to those who are unfamiliar with the different components of the saw. The only way to understand the ergonomic differences between the saws is to pick one up and determine how they feel. Therefore, it is essential to go to a DIY store or tool supplier and see how they each feel in your hands. Make sure that the saw is balanced and is the right weight for you to be able to maneuver. Ensure that you are also comfortable with the blade’s visibility and the components which allow it to be adjusted. Cordless saws are great when you do not have access to electrical outlets. This is probably not necessary though as few workshops lack power sockets. Having an extension cord or two is also a great idea if you are going to be working in a large workshop. Although the amount of power in cordless saws has greatly increased, corded saws still have significantly more power than their cordless counterparts. Therefore, the recommended choice is a corded saw which comes with a long, as opposed to a short, cord. The majority of new saws are sold with a wood cutting blade that is all-purpose and tipped with carbide. Depending upon the types of projects for which you require the saw, this might be all that is required for your saw. However, there are several other blade options which can be purchased in order to cut metal, wood, concrete, and tile. If you are going to require the saw for a number of cutting projects, you should purchase a blade with a high tooth count. Most circular saws come with a few accessories. Rip fences are extremely useful when making difficult long cuts, and nearly every saw comes with one. Hard plastic cases help protect your saw and are frequently included with the purchase of a saw, although some saws come with only a cloth bag or with nothing at all. Dust collection bags are available for a few models, and are useful in a closed space where dust is an issue. With so many options available, it’s easy to find the perfect saw to fit your needs. No matter which circular saw you settle on, it will likely be the most frequently used power tool you own. 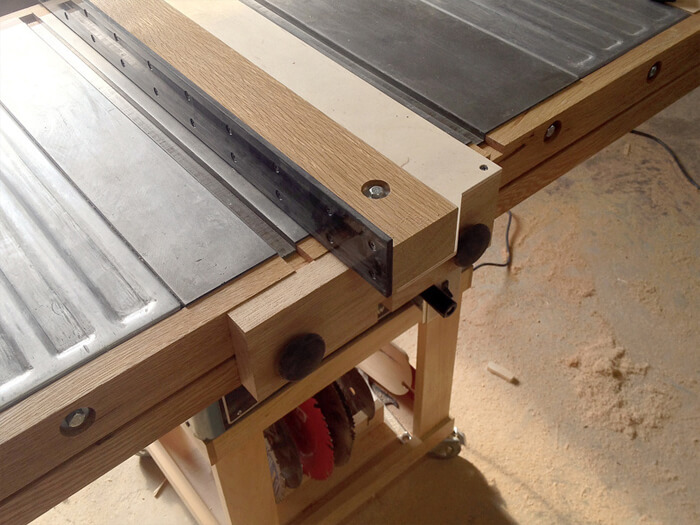 The workbench is the big daddy of the plans you need a Table Saw Workbench Plans to figure out. While you can buy something that is prebuilt, it is never going to be perfectly right for what you need. What you need, what I need, and what that guy across the street needs are all different things. The question comes down to the quality, the visuals (after all, if you are like me, you will show this off all the time) and the usefulness of the space you create. Many will go with something simple like a few open spaces under the table. I prefer to create a table that also works as part of an outfeed. Once I get into my workstation, and into work mode, I don’t want to have to move around more than I need. I would prefer everything to be within arm’s reach. While most will look at a table and see what they can add to the bottom, I feel there are ways to effectively add to the top as well. 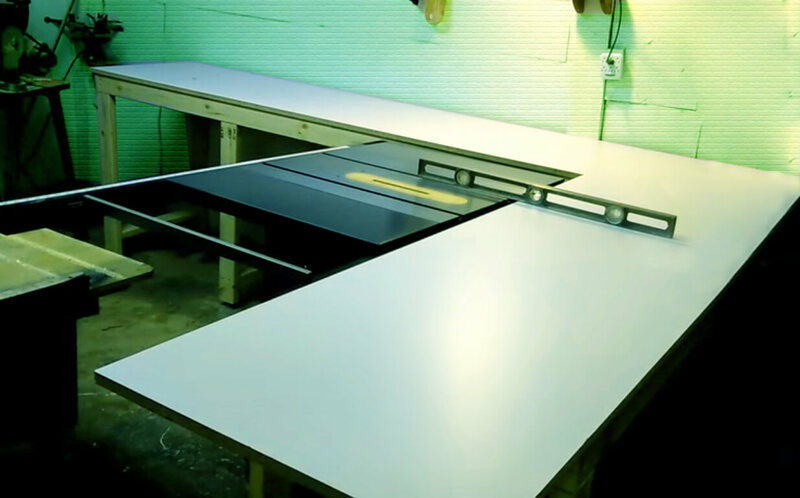 This is somewhat counterproductive at first as you want as much room as possible for your workbench, but if you create a large enough table, many of the items you need can be added on to the edge through a cabinet system. In addition, you can create an elaborate system that is easy to understand by creating a varied group of shelves at differing levels and sizes. Just ensure that they are open on both sides so that you don’t get stuck with wood sticking out while you are trying to get from one item to another. The big part of the workbench is the space you create on the top. Make sure that you have plenty of room to use the fence, the outfeed, and if you decide to add on a modular small tool cabinet, you have room for that. Again, your workspace is going to dictate just how large things can get, but in my opinion, a stationary bench is more fun to get creative with than one that can be moved around. If you do need a mobile work bench, consider combining an outfeed and workbench into two movable parts that create a bigger whole. This will allow you to move the pieces out of the way when you need, but at the same time create a large and engaging piece when they come together. Keep in mind that most go with a traditional plywood color, texture and look, so if you want to stand out, look at stains, or ways to create something that speaks to you and shows that you put your art into your craft. For most, that art is an afterthought, but the best woodworkers realize that the true name should be “wood artists”. Trademark pending of course. A fence for a table saw gives you plenty of options for a little creativity and the ability to add your own personality to your workspace. I’ve seen plenty of homemade fences, but some of my favorites are the ones that tell a story about the individual without impacting the performance of the fence. I’ve had a friend that has been a long time gamer and one of the first fences he created was a Mario Bro.s themed fence. He essentially created a traditional T-square fence but added a few inlay cuts to create the design of one of the old-school Mario Brothers levels. While it was a simple layout and not the best work he has done, the Table Saw Fence Plan was perfect. Now, I feel the best way to create a fence for your best table saw is use what you have laying around the workspace. You can easily create a solid square out of plywood or whatever wood you want based on weight and strength. The key is to create a simple clamp. If you want the clamp to look neat and clean, create it out of wood. This is going to take a little time and practice, but you essentially create a “fat” camp out of glued together plywood. Use that to make sure it gives a tight fit, then create a tightening system with a few screws and a washer with a homemade a simple tightening mechanism. What I prefer though is something more like a lever. It takes a bit of work, but you can easily create a lever with just a few pieces that can tighten the entire fence with a simple flick of the lever. While most of the time you are able to create the piece with about 99% plywood, you’ll need a few pieces of aluminum, such as shims or for the same thing you could use plastic. Glue everything together and you are good to go. There are plenty of detailed 1 to 1 plans online for how to create the specific pieces, but creating the piece is easy enough. Use a polymer cover to create a smoother surface if you need and you should find yourself with an easy to use a fence that is simple to store. Just remember that while the wood can be a simple design, adding those special details can be important. Spend a few hours customizing it. Possibly put a quote on it that reminds you of why you do this work, or names of your family, r even a piece of art that you would like to have in the shop. Woodworkers are constantly looked at as very technical people, but it takes someone with an immense amount of creativity to do this for a hobby or a profession, so make something that shows that part of you. 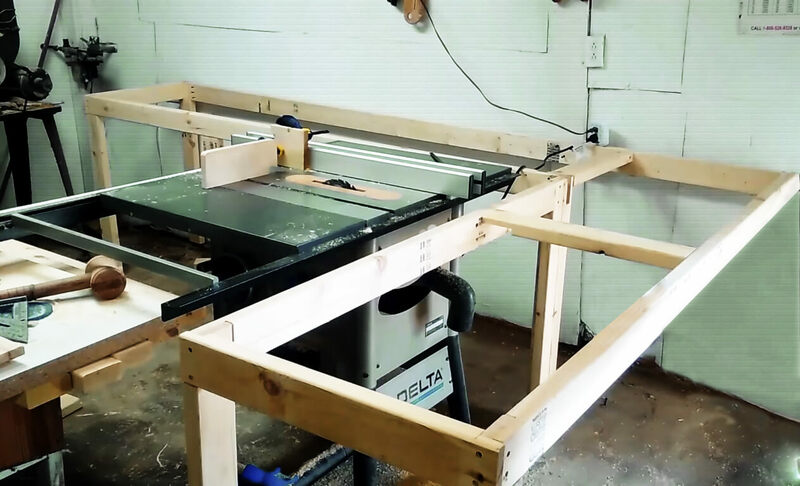 First off, planing of a way to create a best table saw outfeed table is going to be based primarily on your workspace. For smaller workspaces, you may need to look at a small table, for larger spaces you can create a much more significant working table with other tools to help in your daily projects. One thing to keep in mind is the mobility of the table. Do you plan on keeping it stationary, or would you like it to be movable or foldable? Are you going to need something that lets you push the outfeed straight along the table, or would you like to curve it so that you can move it to the side? If you are building your own table saw, you have some ways to create an outfeed that goes with the table, but in most cases, you will likely be creating your own unique design that will fit with the table. In this case, you will want to try to create a flush outfeed table that will look natural with your table saw set up. Granted, this is for aesthetics for the most part, but you will notice that it actually makes it much easier to move around the workspace. A great idea is an outfeed that will work with your natural body movements. 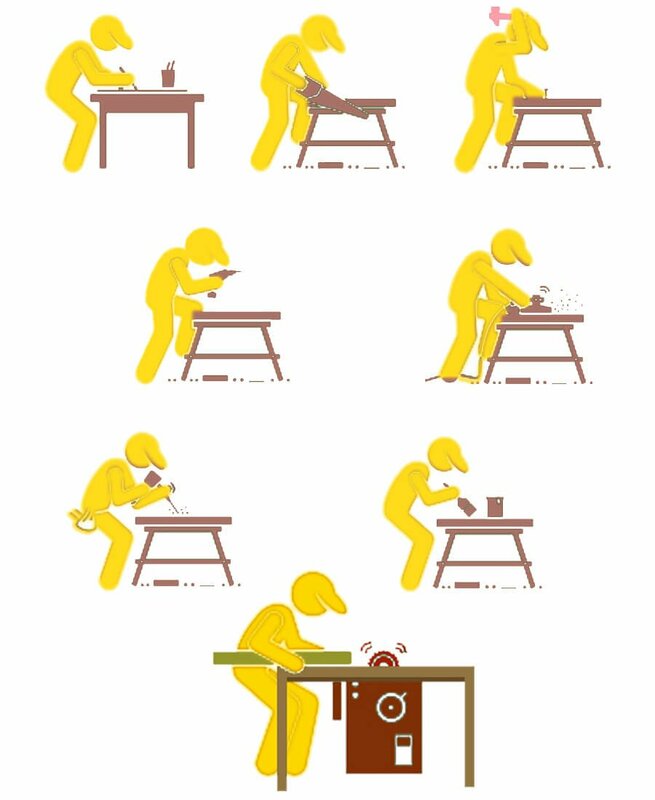 Think of it this way, as you are pushing the cut with your hands, once the cut is finished, where you would like the wood to move and with which hand is you leading. If you lead with your right hand, as I do, you want to be able to push the cut piece off to the right, as your arm naturally moves that way. This leads to creating an L-shaped outfeed that will let you quickly move the piece to a large part of the outfeed table with one hand and very little movement outside of that. There is a problem though as it can be difficult to quickly move the wood if it is against another piece of wood. So proper materials are going to be key to ensuring that the pieces slide easily. I suggest laminate coating and if that isn’t smooth enough, make sure you give it a few coats of a sealer that will hold up well. In addition, you may want to create small edges across the outfeed table to ensure the wood doesn’t fall off as you are moving it. The only issue is you are limiting yourself and the size of the cuts you make. Finally, it is worth considering a quick storage option at the end of the table. Since most of my cuts are fairly thin cuts, when I need to use the table at least, I prefer a tall wooden “basket” for lack of a better term. The bottom of the basket has a bit of padding, and I added a naturally rounded slope to ensure that I can easily slide the wood into the basket. This is a simple design and can be made to be easily mobile, but I keep mine right where it is.